The sun had disappeared completely beneath the horizon when we set out to visit the Travelling Moon. 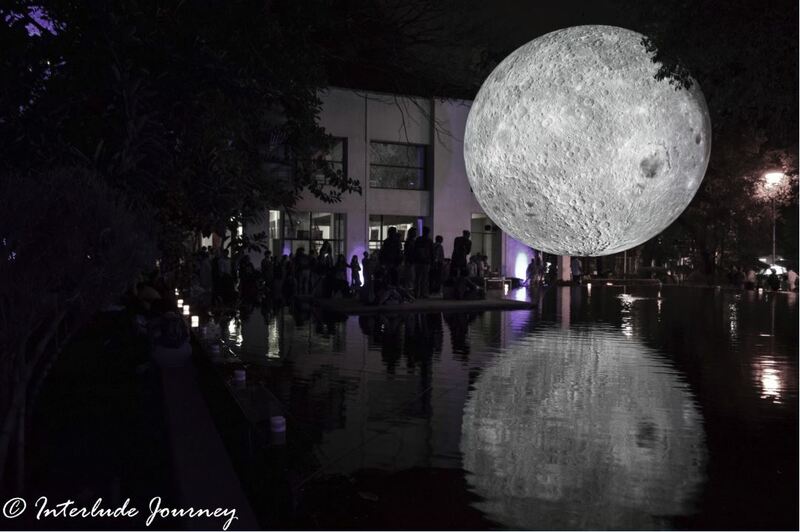 It was an impromptu decision to visit The National Gallery of Modern Arts in Bangalore to see the Balloon-Moon installation that was put on display. We chose to ride a bike to the venue instead of a car to beat the peak hour traffic. All the while we were riding the bike, I was wondering if it was worth taking such a risk to visit the museum. I would not have contemplated much had it been any other day. But 31st of January 2018 was different. It was the day of the first Lunar spectacle of the year when the three lunar phenomena of Complete Lunar Eclipse, The Blood Moon, and the Super Blue Moon occurred at the same time. I would not have traded the opportunity to watch the spectacular lunar eclipse with anything else. However, a picture of the Museum of Moon that I saw earlier that day had enchanted me to the core. Whether the actual exhibit would live up to my expectations, I would only know after visiting the gallery. The National Gallery of Modern Arts was housed in Manikyavelu Mansion, a heritage structure located in the posh environs of the Bangalore. Spread over an area of 3.5 acres, the Gallery was a repository of the cultural ethos of India and showcased Indian art starting from the early 18th century till the present times. The ancient structure was well illuminated with white and purple lights. The huge trees in the gallery premise swayed to the gentle breeze. Floating in mid-air over a mirror pool by the side of the gallery was the Museum of Moon- a replica of moon created by Luke Jerram, A Bristol based multidisciplinary artist. The vicinity of the pool was mostly dark but for the light emanating from the candles placed around the pool. It appeared as if the Moon had escaped the eclipse and descended to land. The reflection of the Moon in the ripples of the mirror pool made the entire installation even more magical. A captivating soundtrack composed by BAFTA and Ivor Novello award-winning composer, Dan Jones which encompassed recordings from NASA and space machines along with the sounds of the sea and of moths played in the background. There were not many people at the venue. we were told that the council did not advertise the event much to avoid overcrowding. Those who had visited walked languidly around the pool in silence enjoying the celestial beauty levitating amidst them. A few people sat by the side watching the exhibit. 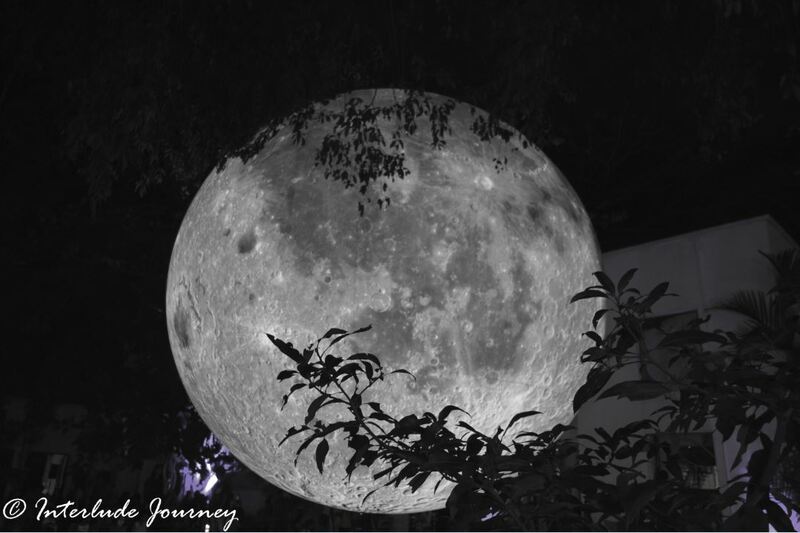 Photography enthusiasts were busy capturing the moon from different angles. The young and old stood in awe appreciating how real the replica looked. A few wondered if it was really a balloon. Some felt it could actually be a concrete structure.The surface looked too perfect to be fake. 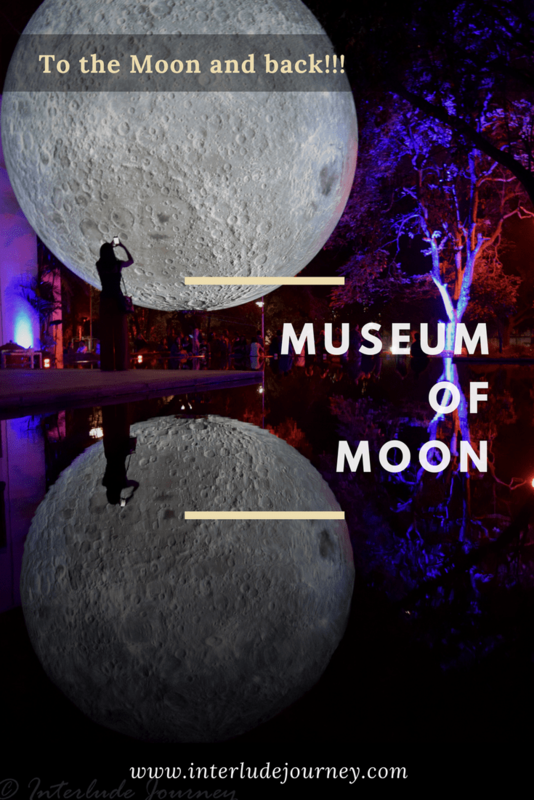 The fact that the surroundings of the exhibit were made darker made sure the moon stood out as a single point of attraction in the entire arena. Everyone with a camera, be it a DSLR or a smartphone had turned into an Astrophotographer. 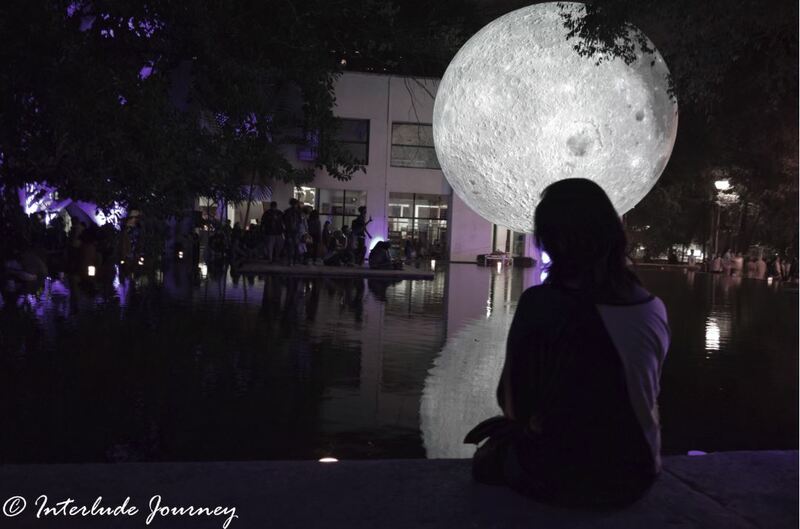 A platform located in the middle of the pool connected by a series of stepping stoned had become a ramp for people to get photographed with the moon looming over them. I simply chose to walk around the pool clicking silhouettes of people with the moon as background. I had almost forgotten the eclipse and the supermoon until an announcement was made that the Red Moon was visible clearly. It was a moment of mild chaos when everyone rushed to a vantage point to get a glimpse of the eclipse. 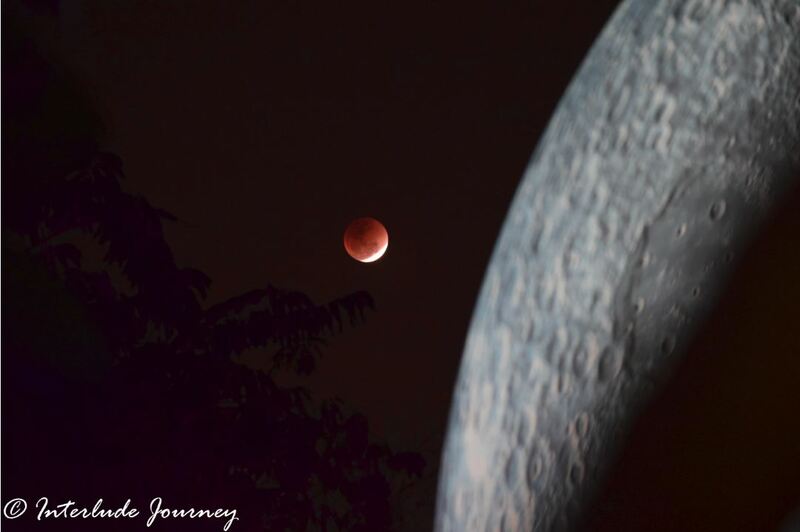 With Jerram’s Moon in the foreground, I saw the Blood Moon engulfed completely in earth’s shadow in the background. It almost felt like I was part of some augmented reality world depicting outer space. While the whole world was busy witnessing the lunar eclipse, I went to the moon and came back. Best, I happened to see two moons at the same time. I could not thank my stars enough for the opportunity to see the almost real moon so up close and at the same time witness the real moon slowly waxing out from the shadow of the earth. 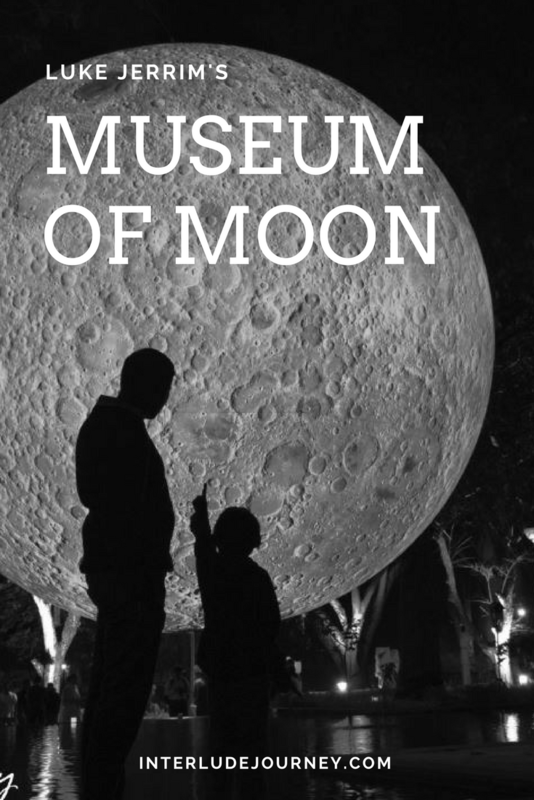 The Museum of Moon is a replica of The Moon created by Luke Jerram, A Bristol-based installation artist popular for his sculptures, large installations, and live art projects. It took over 20 years for Jerram to bring this idea into being. The Moon is actually an air-filled replica of moon measuring 7 m in diameter. The surface of the balloon is made of 120 DPI detailed imagery of the lunar surface captured by NASA’s Lunar Reconnaissance Orbiter Camera. 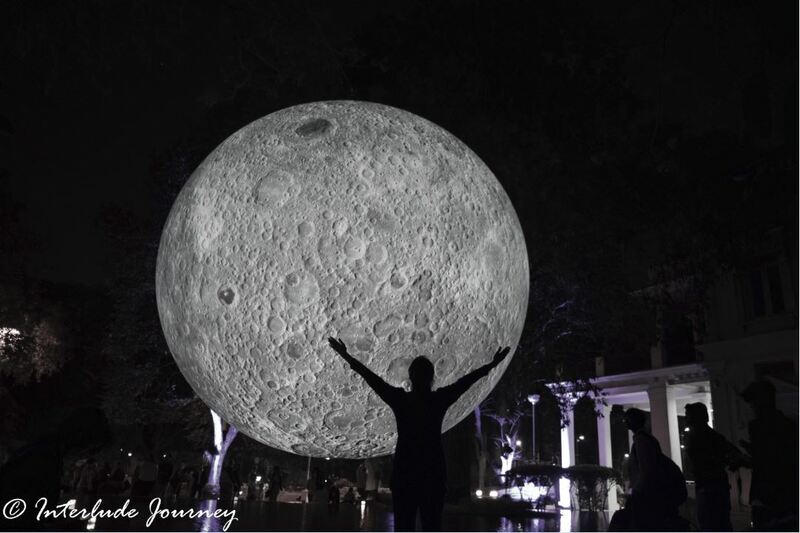 At a scale of 1:500000, each centimeter of the installation represents 5km of the lunar surface. Ever since its launch in 2016, the Moon has been touring the globe. Currently, The Moon is being displayed at various location across India for the month of February 2018. Click here to know the schedule of the touring moon. Beautifully captured and wonderful narration. Wow! Truly a magical experience. Imagine spotting 2 moons together! Thanks so much for writing about this. This is so amazing. Missed it this time. Hope to watch this sometime soon ! Im sure this must have been such an amazing experience. What a cool way to experience the eclipse! Even in pictures it’s hard to believe it is, in fact, a balloon. The imaging is strikingly realistic. Thx so much for this intriguing post on the National Gallery of Modern Arts in Bangalore. It looks like a fabulous place to visit. I had read about this in the papers. Now that I see your photographs which capture the installation in all its essence, I understand what the fuss was all about. I especially enjoyed the photo with the blood moon contrasted against the installation. A special kudos to you for braving the Bangalore traffic to get there. That sounds courageous. I wouldn’t have dared to visit the Moon museum on the Blue moon day. But then I would have missed such beauty. Despite the crowd you have got some amazing shots of the moon; especially the one with the reflection in water. This is something we really missed. Our attention was focused on the super moon and the Lunar eclipse. This was indeed a great experience watching the “moon” at such close quarters. Just checked the schedule, but realized it is too late. Hope to catch up with this moon somewhere, someday. 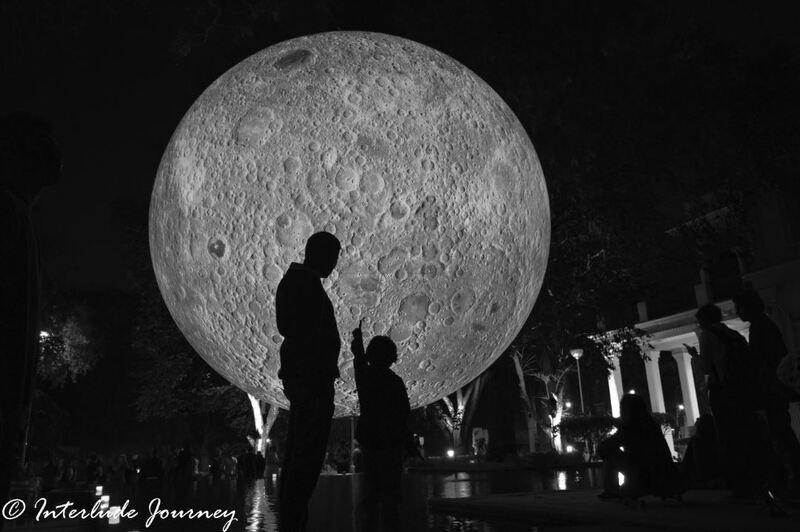 Love this post about your impromptu visit to see the Balloon Moon, I had never heard of it but find it fascinating as an art piece. And great for you that it was not a crowded event, though sad they didn’t market it very well as it deserved a bigger audience. What a great timing to do this on night of the eclipse! Oh this looks like a wonderful photo op! It’s good to know that there wasn’t a lot of crowd, that’s my kind of experience.